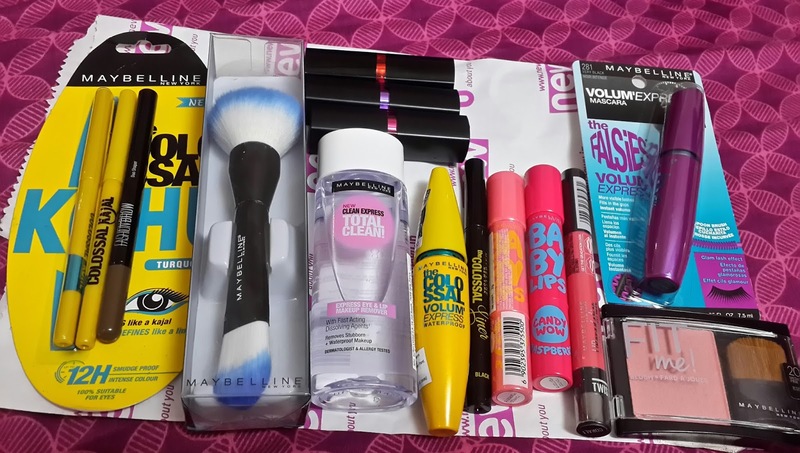 Coz maybelline is amongst those Drugstore Brands which is really great with their innovations and has really good Quality Products. Its specially good for young girls who love to experiment but does not want their makeup to cost a bomb! So i just love maybelline and whenever there's a new launch, i hit the store to test it out or just order online. 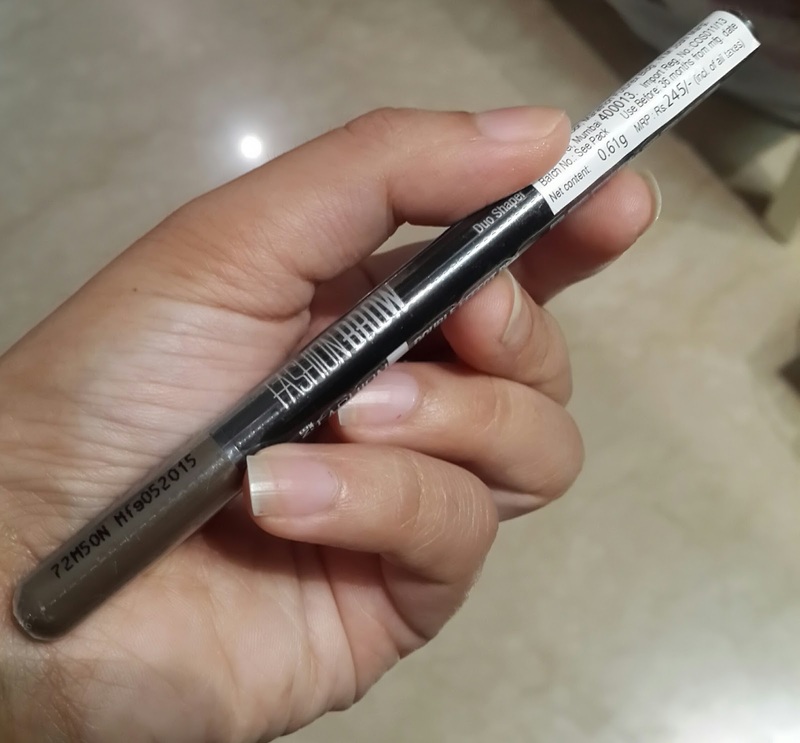 Since you girls know that the winged liners have been a trend ever since and sometimes you are struggling for that perfect wing, then this baby will come handy and will make your life very easy. Its for Rs 425 for 1.2 g of product. Very easy to use..just like a sketch pen but for your eyes, to make that perfect wing! Its jet black but ya it is not waterproof so if you are looking for waterproof version then look for other options! 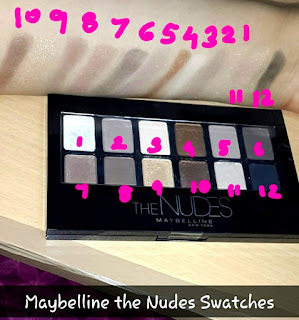 Find the swatch in the pic above. 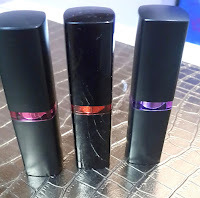 You all must have been acquainted with the black one since many years, its creamy,jet black and super affordable..good for daily wear, i have finished several tubes of these however i have a lot of other favourite black kajals that i would share with you all in my other posts. 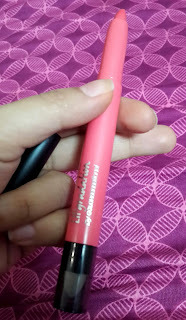 But this time i went ahead and bought a blue one and also a green one (jade color).I would recommend them as they are very affordable and glides on easily and stays put for good 5-6 hrs after which you have 2 retouch it a bit. 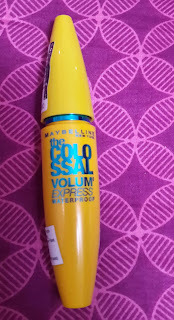 Maybelline has some best Mascaras in the market. 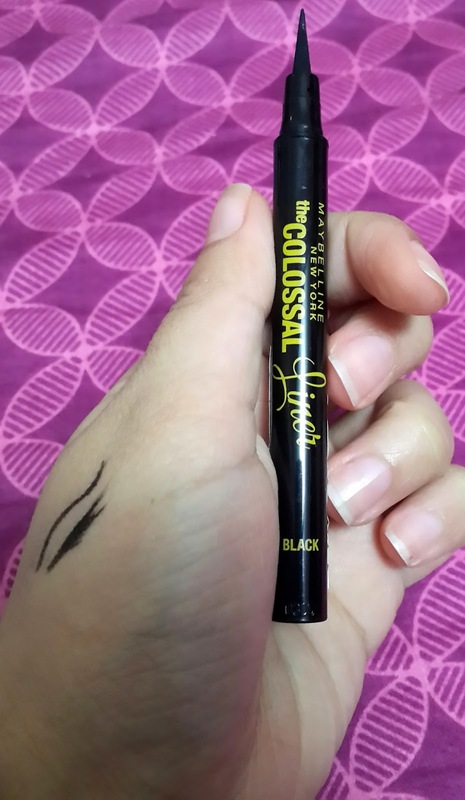 I am hooked on to their Collossal waterproof mascara. 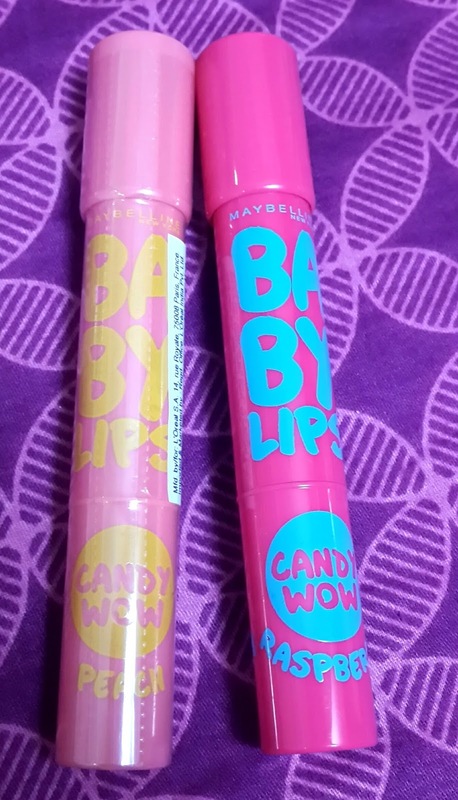 I have finished 2 tubes already in past..and got my 3rd tube! 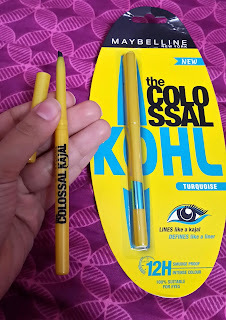 They have two variants, Waterproof and Non waterproof but i bought the waterproof one as you never know when you might need a waterproof version.I got it for Rs 350 for 10 ml product and it is such a voluminising mascara. It does not clump and It hands down wins my vote and i strongly recommend it. 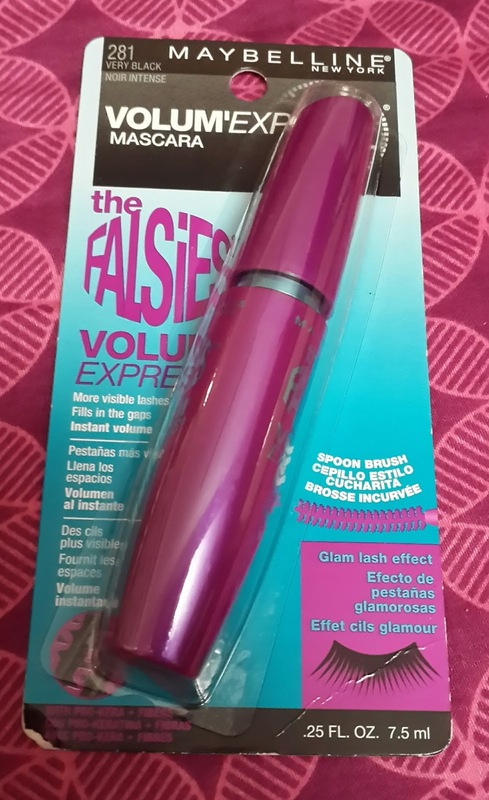 This bottle just looks gorgeous and attracts you just by its name "falsies" .You all know how the youtubers wear false lashes but it takes so much effort and for everyday it isn't worth the hassle! 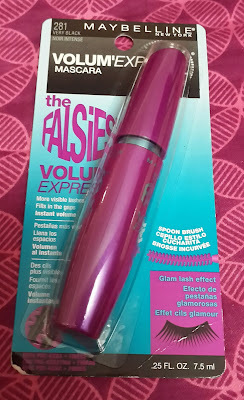 Not every 1 owns them or uses them ,so for those big voluminious fluttering lashes you gotta own this product. 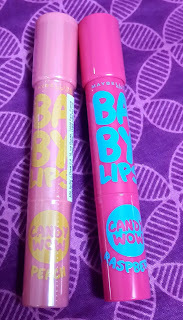 I have the washable version and Its for Rs 475 for 7.5 ml but its worth it. I got the Hyper glossy liner in Gold. Yes coz i wanted a perfect gold liner for the parties and i wasn't dissapointed. 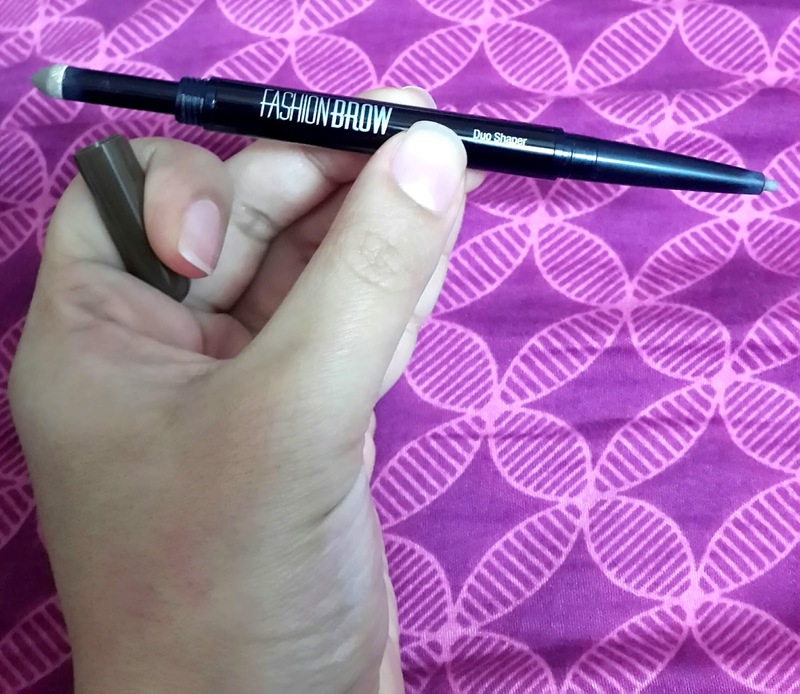 I ordered this one frm nykaa and have been loving for my party looks. Then comes the NEW LAUNCH in the Market. We all love the matte black gel liners in tubs but when they come in Liquid matte form then you know you gotta own it! This is a new baby and i am yet to try it.I will review it for you. once i like it. 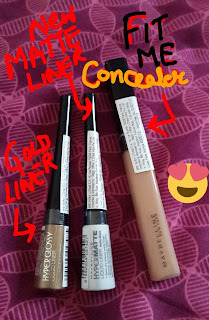 It comes for Rs 325 for 3 g.
I ordered the medium tone concealer but somehow i got the dark one, this is the pic of the dark one..which looks quite light. 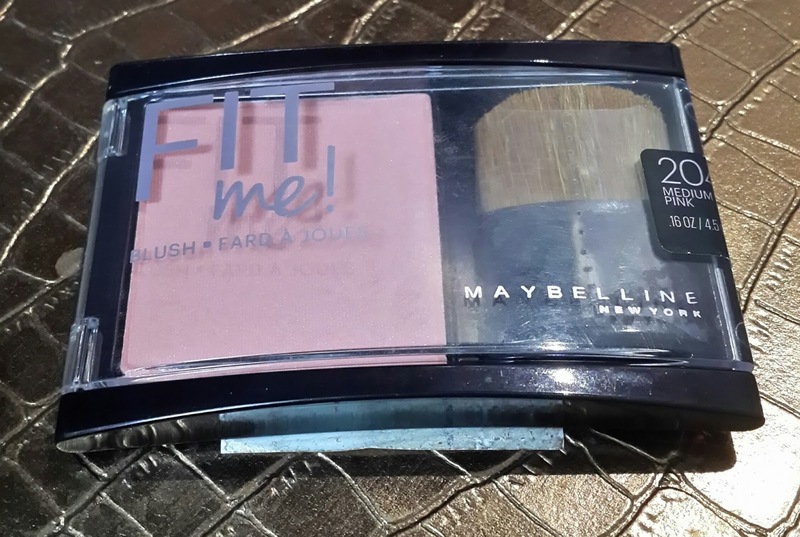 Its such a gorgeous Blush. 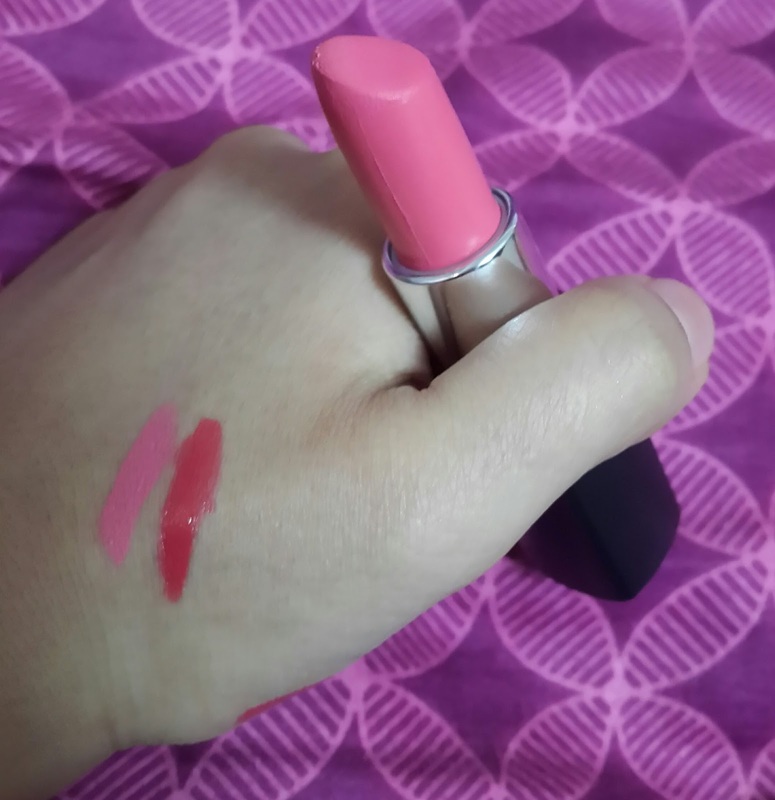 I got mine in shade 204 medium pink. 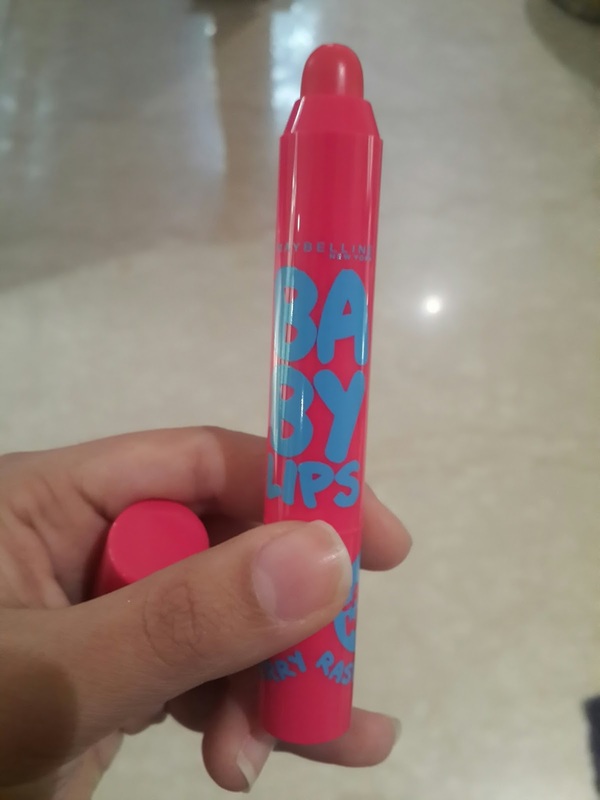 Its for Rs 475 and has a applicator and plastic casing. 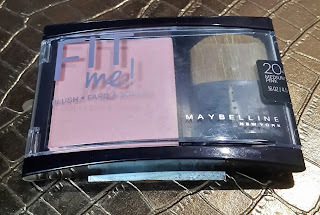 Will do a post on the Fit me range and will review all the Fit me products for you girls. 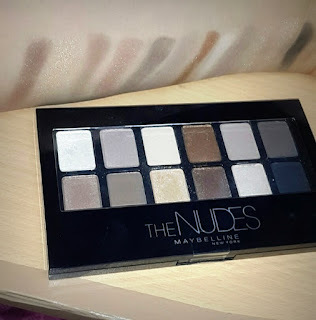 This is such an affordable Nudes eye shadow palette. 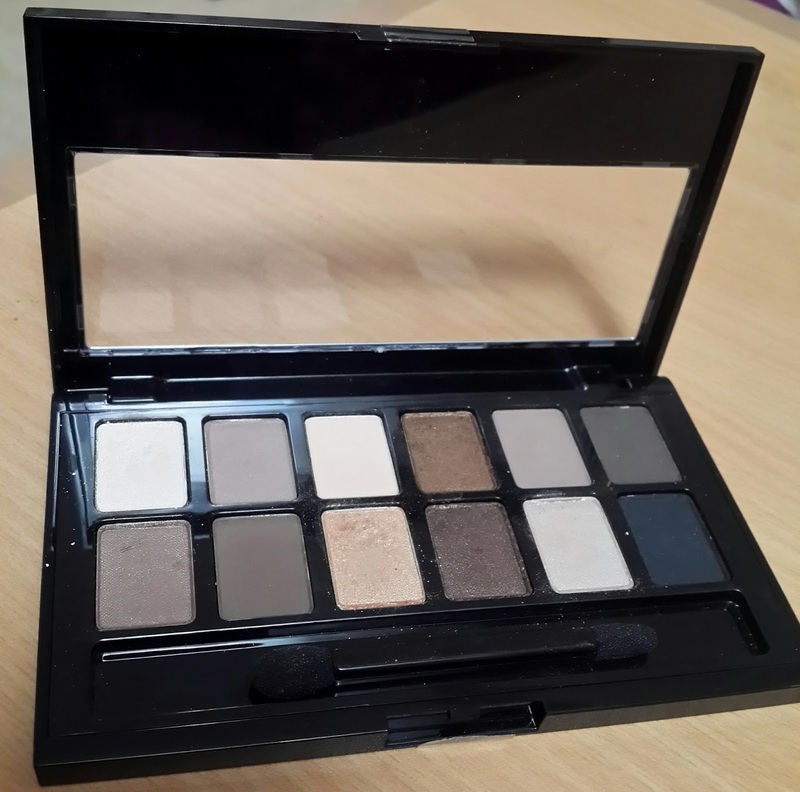 Its for Rs 899 for 12 eyeshadows, which is a great product. 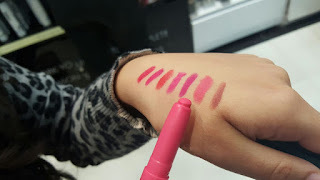 I have swatched all the 12 shades for you. 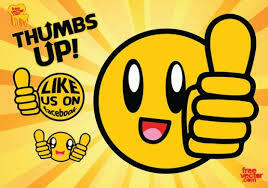 Its a multitaskting product as you can use the color no. 8 to even fill in ur eyebrows and Color no. 2 and 8 as bronzers also to sculpt the hollows of your cheeks. Who doesn't like eyebrows on fleek. Proper shaped and thick eyebrows are every girls wish. So if you don't have thick brows, you can make them appear thick or full by buying this amazing Eyebrow pencil duo, which has the crayon on one side and the powder on the other. It comes is two colors brown and grey .Girls who have black hair in their eyebrows should go for the brown one so that the eyebrows doesn't look made up and look natural and girls who have very light eyebrow hair can go for the grey variant. Its for Rs 245. Firstly use the crayon side to define your shape and then fill in with powder for a perfect defined look. 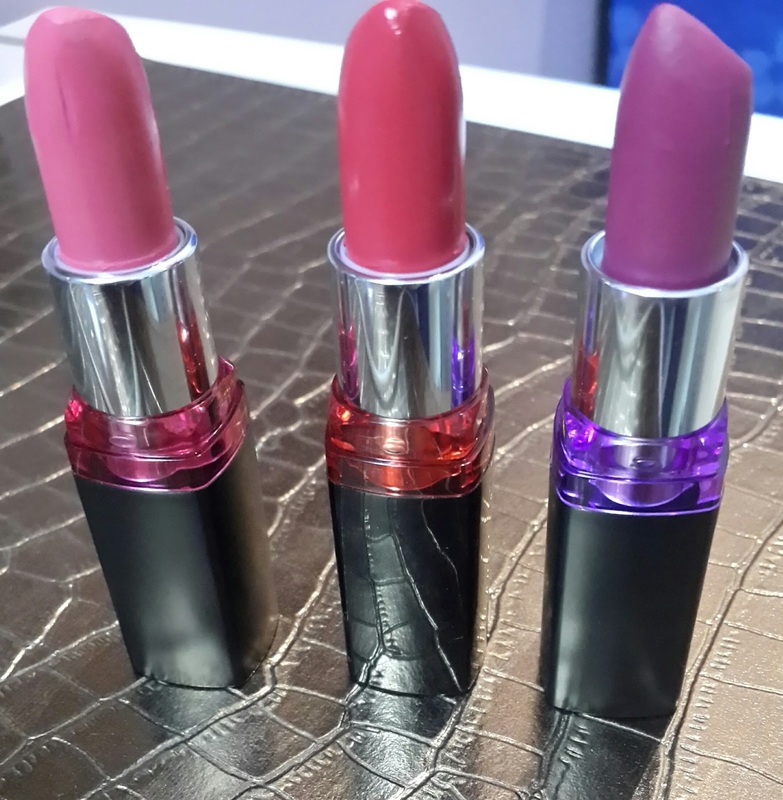 After the perfect eye and face products , its time for some perfect and afforable lippers. 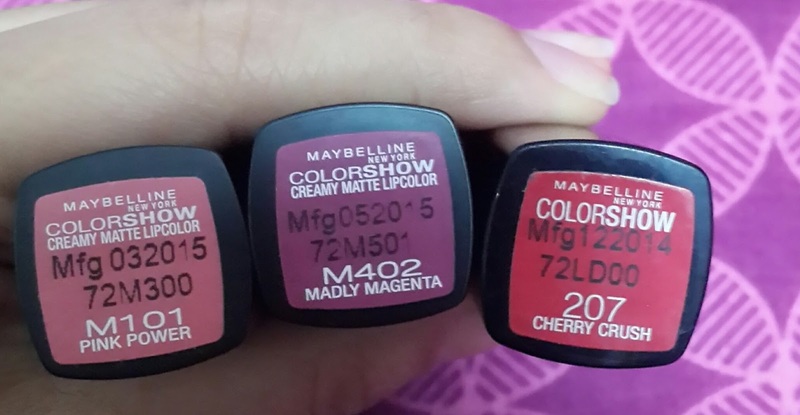 Maybelline has a hugeeeeee range in that. 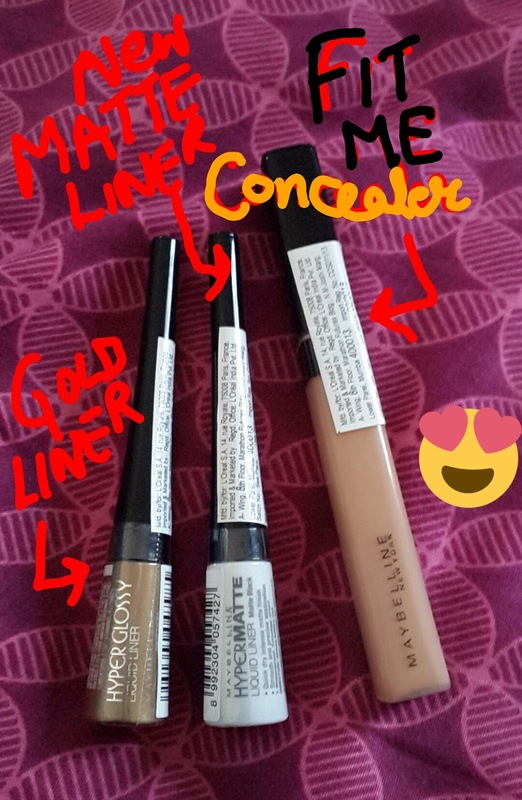 The normal one has shiny plastic whereas the creamy mattes has matte black packaging! 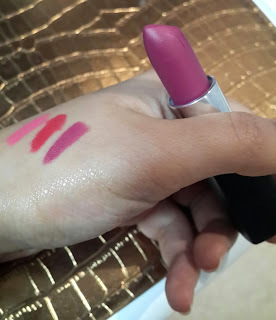 The normal one is the one in the middle which has a glossy finish but is very high on pigmentation, which i really like, its called Cherry Crush and has reddish pink tinge.It was for Rs 275 when i bought it.Prices may have escalated now. Its such a gorgeous lipstick.I recommend you to try.Its so affordable and worth it. Then maybelline came with the creamy matte in color show range as we know matte lipsticks are such a hit. 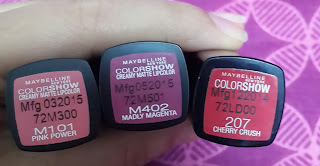 I got a pink and a mauvy berry color. Check the shade names in the pic above. These are the new lip crayon launches by maybelline. 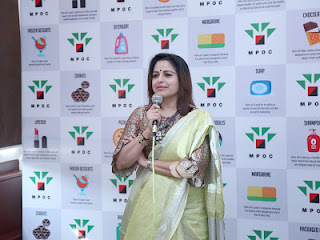 Its best for that no make-up makeup look. 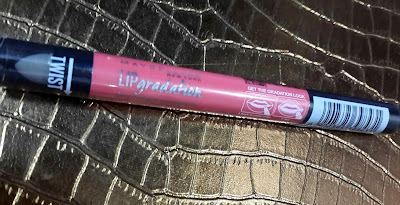 I have tried it and it has a creamy texture and stays put but yes it does transfer from the center if you have something warm or oily so you have to reapply when it fades. Its for Rs 500. It has a lot of colors to choose from. 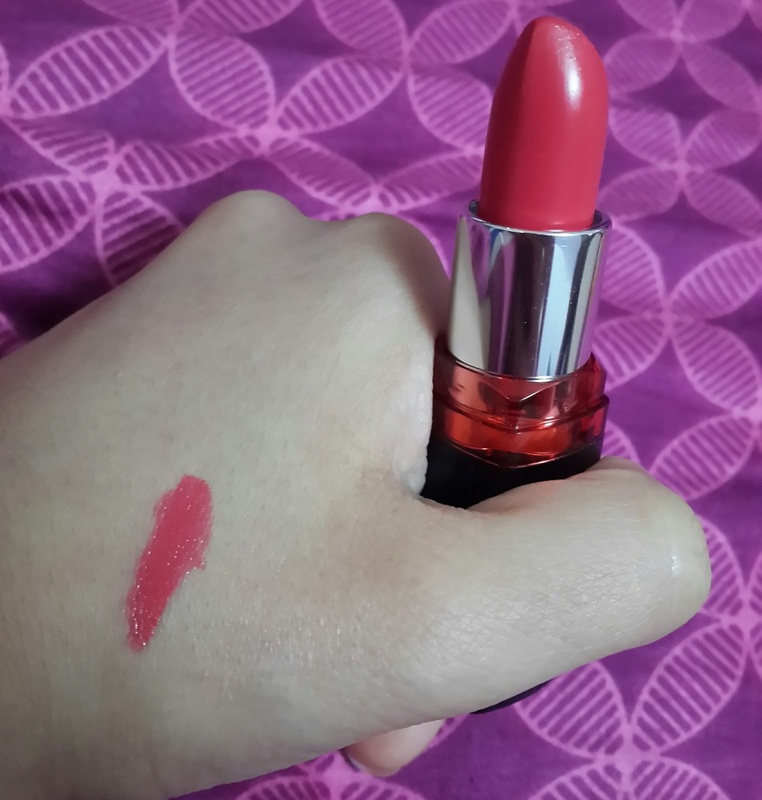 but i chose Coral1 which is a pretty peachy colour. I already had the Raspberry one and i got the Peach one too.Its for Rs 275. I have already reviewed these in my skincare haul. I hope you liked this Maybelline haul post and would share my Blog and social media links with your friends. 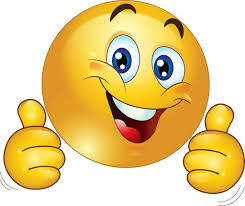 and Join as a member on this blog by clicking the join me Button on top right. All my links to my social media are also mentioned to the top right of this page.